After twenty hours of airplane and seven hours of train-ride, I arrived at Taitung, a quiet city surrounded by mountain cliffs on the west and lined by the Pacific Ocean on the east. In many Taiwanese' mind, Taitung is marked by natural beauty yet underdevelopment. Two-thirds of its population consists of the aboriginal Taiwanese people, who were historically plagued by unemployment, alcohol, and neglect from the government. Many of the native tribes are situated in the remote mountains and have little access to medical care. 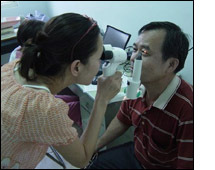 Taitung Christian Hospital (TCH) was started in 1969 by an American physician, Dr. Frank Dennis who moved his family with 4 children from Colorado to Taiwan, learned Mandarin, and started seeing 200 patients each day with tuberculosis, polio, trachoma, snake bites, fractures, and so on. He realized the need for a hospital, campaigned for donations, and finally built the first regional hospital in Taitung. Forty years after its establishment, the hospital was still sending medical teams into the mountains to care for the aboriginal people of different tribes. I worked as a volunteer doctor with the team of physicians, pharmacists, and dentists at the mobile clinic. The team drove a truckload of equipment and set up daily temporary clinics at the local health department buildings or elementary schools. The truck circled around the village and broadcasted in tribal language to inform villagers of our arrival. In minutes, people started to come in. They were mostly elders and children with diseases ranging from diabetes, gout, liver cirrhosis to common cold or routine pap smears. The diseases were not different from what I saw in the U.S., but the way of providing health care was different. The patients and the staff behave like a large family. The patients brought their home-grown mangos or pineapples for the staff. The doctors inquired like an old friend about patient's job search or family members' health. The whole clinic applauded for a diabetic patient who finally reached his ideal blood sugar while he laughed with pride. One doctor told me that because of years of neglect and abuse by the government, the aboriginal showed a lot of distrust at first. But slowly they built a relationship with each visit, and now the bond could not be broken. In addition to the mobile clinic, I also worked with other services that TCH provided. I went with the physical therapist to conduct physical and occupational therapy for underserved children at their homes. These kids had cerebral palsy or other developmental delays, but the parents could not afford taking time off work to bring the kids to the hospital for treatment. So we drove hours to visit each child at their remote homes to provide therapy, to give "homework", and to record their progress. I also went with TCH to deliver "book truck" and "Story Mom" for elementary school children. Many schools did not have resources for a library, so a truck full of donated books gave children the opportunity to read extracurricular books. Along with the book truck was "Story Mom" and I, who used the opportunity to tell stories and to educate kids about their health. I went to the physician's morning report, during which they discuss educational issues pertinent to their healthcare environment. One morning a week, I joined the music team to play music and to sing songs at each ward around the entire hospital, a tradition that the TCH had for years. I went to Taitung with an intention to help them. But in return, I was given so much more. I was showered with kindness and patience everywhere I went. I learned about the different ways of conducting medicine in an area with limited resources. More importantly, I came back with an expanded vision of how much a doctor and a hospital can do for its community.